Join the Georgia Chapters of the Southern Off Road Bicycle Association for a weekend of IMBA Epic rides and fellowship in the North Georgia mountains! 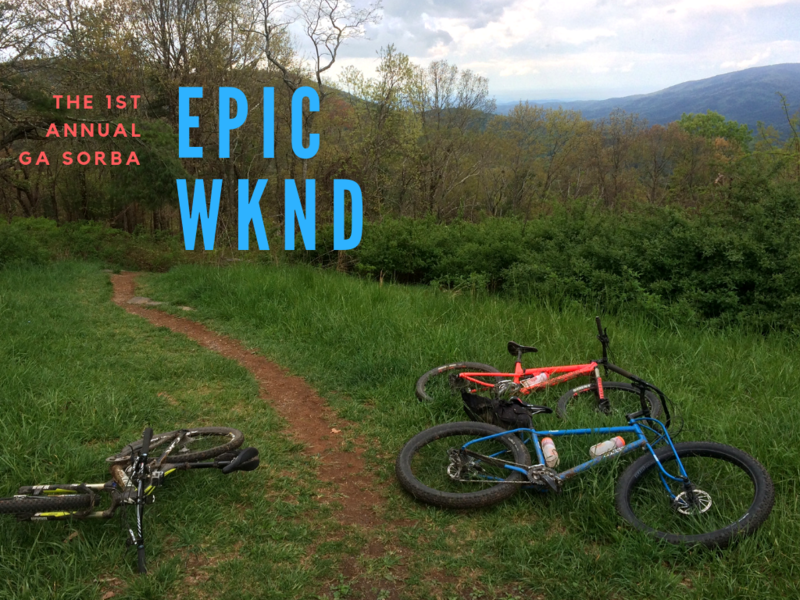 Inspired by the Nimblewill Mountain Bike Festival of days gone by, we are reviving an annual weekend to celebrate the work of our Georgia SORBA Chapters and the great riding and camaraderie of our Georgia mountain bike community! In our inaugural year, we could think of no better place to base camp than with our good friends and sponsors Mulberry Gap Mountain Bike Get Away. On Saturday, we will ride the Bearhoti route straight out of Mulberry Gap, the classic combination of Bear Creek, Pinhoti section one, Pinhoti section two and then back to the Gap. All reservations for weekend accommodations will be handled through Mulberry Gap. You can choose your meals and your lodging, whether you want to camp or stay in one of their awesome cabins. A two-night stay is required. Reserve through their website today: https://www.mulberrygap.com/cabin-camping-reservations-mulberry-gap/. Have questions about accommodations? Call 706-698-2865 or emails reservations@mulberrygap.com. To register for Saturday’s Bearhoti ride, make a donation to North Georgia Mountain Bike Association here. We suggest optional donation of $10-$25, but you can give as much as you like! All the proceeds will go for the maintenance of Bear Creek and the Pinhoti Trail. If you are just coming up for the day you must buy a Mulberry Gap Day Use Fee. This $10 fee covers all facility fees for Mulberry Gap which include parking, wifi, showers, and a SAG stop. Prefer to skip the 4.5 mile gravel climb? You can opt for a seat on the shuttle for an additional $10 and you’ll meet us at the top of the climb. Mulberry is also offering a bagged lunch option for $10. The SAG will be included on the route with water and light snacks. The ride starts from Mulberry Gap in front of the office at 10 A.M sharp. Shuttles leave at 10:30 and are limited to 24 riders. You must buy a ticket here to register for the ride and you will need to sign a waiver on site. To register for the Sunday Group Ride at Bull Mountain, you can make an optional doantion here. Once again, we suggest $10-$25. All donations are voluntary but all proceeds will go to aid in future trail maintenance at Bull and Jake Mountains. The Sunday Group Ride will start and end at the Bull Mountain Parking lot. The ride starts at 11 A.M. You will need to sign a waiver on site for this ride. SORBA Rain Policy: In the event the trails are too wet to ride per SORBA’s policy for responsible riding, we will have a gravel route option for both locations. The great news is both Mulberry and Bull Mountain have some of the best gravel riding in the state, so a good time is guaranteed! Can’t spend the entire weeekend with us but have either day free? Join us for a great day in the mountains for either ride. Remember, if you want to ride, you MUST SIGN A WAIVER for either one or both of the rides. Also, we hope that you make a DONATION to help the maintain the trails we all love to ride! Any questions can be directed to Brett Davidson, President of MTB Atlanta at sorbabrett@gmail.com. Thanks and we look forward to seeing you for an epic weekend in the mountains!